I remember Oldton as a small rural Eden, but on the other side of town things were different. 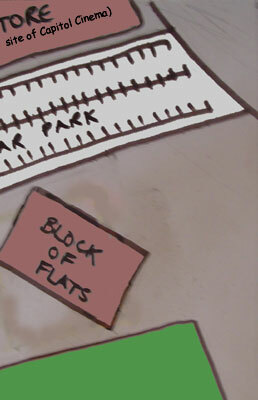 Here we find a block of flats, a giant car park and a superstore - all the things we associate with modern urban living. You can see the flats in one of the photos taken on Matthews Street. No-one as yet has written to me about what it was like to live there. The superstore - I think - replaced the Capitol Cinema remembered by Pamela, Muriel and Martin. What with this and the motorway, it looks suspiciously like a wave of concrete and tarmac encroached on Oldton from the north west, rather like an Ice Age glacier slowly but surely creeping over the landscape, crushing everything in its path.